Most of the devotions in this book would be good jumping off points for group discussions or personal meditations. There were a few where his theology was weak - almost heretical. Yet for someone grounded in their faith, the book will challenge thinking and what you believe and as such can be a tool to help deepen your roots as a Christian. This is the last of the books in this never-ending series of books, games, spin off series and more, that I actually made it through. The writing quality dropped with every volume. In less than two decades they wrote 16 novels - over 7200 pages in the main series alone. They have eclipsed Piers Anthony's Xanth which took many decades to write. In this series I never really agreed with the author's theological view of the end times, even though the series started off as good fiction, with entertaining books that made a reader think about the end times. Yet as the series dragged on, the writing became weaker and weaker, and for myself and many I know the authors lost the audience. I never made it through the whole series and I doubt I will ever go back and finish it. It really is a pity as there was so much potential in this series. Everybody is out to be the one to kill the Antichrist (Nicolae) - Mac, Abdula, Chiem, Rayford. But we are left hanging about what really happens. The Trib Force team again loses members, Doc dies and Leih joins the team. Cameron travels to Israel again and sees the two witnesses resurrected and called up to heaven. In the end it just seemed link a money-making ploy, with graphic novels, cds, teen versions, a video game and more. It is a pity this series dropped in quality so much. Jenkins went on to write an excellent trilogy - Soon, Silenced and Shadowed, that were set in a different interpretation of a future with a one world government. In this series I never agreed with the author's theology. But the series started off as good fiction, entertaining, and were books that made a reader think about the end times. However as the series dragged on, the writing became weaker and weaker, and for myself and many I know the authors lost the audience. I never made it through the whole series and I doubt I will ever go back and finish it. It really is a pity - there was so much potential in this series. This book was an interesting interpretation of the third woe from the Book of Revelation. The plague of the locust attacking the word is done in vivid graphic narrative. The Trib Force team has both losses and gains. The most important is Hattie leaving and joining the dark side. Buck and Chloe have their child. In the end it just seemed like a money-making ploy, with graphic novels, cds, teen versions, a video game and more. Though this book is not much better than Alice's Adventures, the chess motif and theme does make the book much more interesting. With the bossy, dominant Red Queen and the quiet, kind, messy white queen, the book is a study in contrasts. 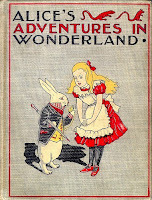 The interweaving of the Nursery Rhyme Characters and the frequent fish poetry references does provide more continuity and a sense of sequential events than Alice's first adventure. I also appreciated the linking of the cat at the beginning and end of the story. It does still feel like Carroll did way too many opium pipes in his time. 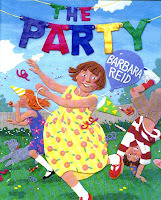 Famed Canadian author and illustrator Barbara Reid has created another wonderful book for children. 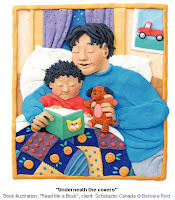 Reid has won just about every Canadian award for children's authors or illustrators, and her unique plasticine illustrations are known and recognized the world over. In this story she not only uses her trademark images but incorporated found objects to enhance the images and tell the story. 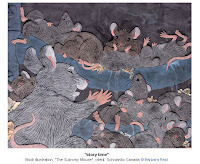 This story is of a mouse named Nib. He is fascinated with items he finds around the subway station he lives in. In his home of Sweetfall, there are legends of Tunnel's End. Nib is fascinated and captivated by these mouse myths. One day he is compelled to search for Tunnel's End and his and our adventure is just beginning. His quest leads him through other mouse towns in different stations, and he meets Lola who joins him on his journey. Pick up the book and follow Nib on his journey; it will be a fun and wild journey. My first impressions of this book were that it was like reading C.S. Lewis on cheap drugs. The events are complete non sequiturs and the changes in plot are worse. It appears to be a spoiled child wandering in a world she does not understand, nor is willing to learn about - unlike Lucy in The Lion, The Witch and the Wardrobe who seeks to understand the local customs and circumstances. The book is very easy to read but it leaves distaste in my literary mouth. I know it is considered a classic but I just do not see it, and if I did not have to read it for school I would not have bothered to finish it. 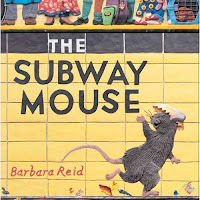 Barbara Reid is a world renowned Canadian author and illustrator. Reid has won just about every Canadian award for children's authors or illustrators, and her unique plasticine illustrations are known and recognized the world over. She won the Governor General's Literary Award for Children's Illustration with this book. This is the story of a family reunion/party. It is the story of two sisters who are nervous and hesitant at the beginning of the day, and a little shy about being at the party. Yet as the day wears on the children have their own fun and adventures as the adults catch up and enjoy the party also. With incredible illustrations and a great story, it is a book that will be fun for the whole family. This book is Christian speculative fiction. It was very interesting because it presents a possible future in which a second civil war takes place in the United States. It has some wonderful plot twists. Basically it is the story of one man Douglas Richfield, a member of the peoples' movement (Socialist) who becomes a constitutionalist. It is the story of his development as a person, and as a person of faith. He is awoken from rote life living as a cog in the machine, to being a man of conscience, to finally a man of character. It has elements of being a spy story, a love story, a story of political intrigue and faith all rolled up in one neat consistent package. It is a good read that I could honestly recommend to just about anyone. What's a Penguin to think when he turns Pink? This is a fantastic book about being different and being accepted. 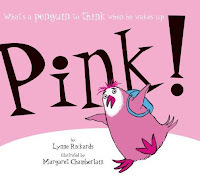 It is the story of Patrick the penguin who wakes up one day and has turned pink. He finds it hard being a pink penguin so goes in search of other pink birds, specifically flamingos in Africa, but he finds out he fits in even less there. So he returns home to Antarctica and discovers that being different is not so bad after all. I was originally attracted by the hilarious cover of this book, and both the story and illustrations are wonderful. It is one of those fun books to read and look at. I think it would be fun to share with most children, and they will learn a lesson from it also. Pink! is an excellent read. This is a great picture book for children. It is the story of four friends trying to get out from the rain and the cold. Unfortunately they take refuge in a Bear's cave. Bear is not happy that they have invaded his home. Lion, Zebra and Moose try to make bear happy by making him like them; Sheep on the other hand gives of himself. 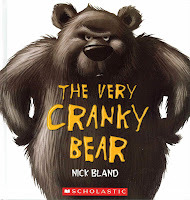 It is a fun read and wonderfully illustrated by Australian author and illustrator Nick Bland. It has made me want to track down his other stories, and the books he has illustrated for other authors. This was a very good book of poetry and Rilke is one of my all time favorite poets. The poetry in this volume cuts to the heart. As I read I could not but hope and pray that the words would have an effect upon my heart and my life. A number of the poems moved me in significant ways. I copied Oblation and The Knight out in my journal. I end up seeing myself both as Rilke observing others and as those whom he observes. I always look forward to pursuing more of his writings. This book was a great edition with the English translation and the German original on facing pages. We received this book free in a welcome pack from the Ontario Early Years Centers when our first child was born. It is a great little book about the joy and pleasure of reading. It is one of the first books I read my daughter and she asked for it again and again. The story is written in a rhyming verse that is fun and easy to read. The story is light and bouncy and the illustrations fantastic. 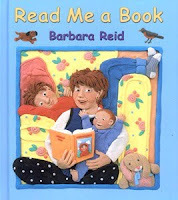 Barbara Reid is a world renowned Canadian author and illustrator. Reid h as won just about every Canadian award for children's authors or illustrators, and her unique plasticine illustrations are known and recognized the world over. In this story she not only uses her trademark images to encourage reading and family activities, it's a great little book. Our first copy has been destroyed by use and has needed to be replaced. Originally published in 1897this book is considered to be the turning point in Conrad's career. 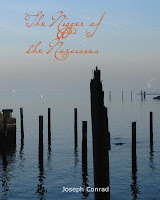 The book has also been published under the title The Children of the Sea: A Tale of the Forecastle. This is a very good short novel. It has strong characters, great navel insight and is a study of the character of men. It also has to do with the lives of men in general - the good, the bad, and the indifferent. In an interesting way it weaves a tale of deceit that becomes a reality. James "Jimmy" Waits, a west Indian black sailor waits for illness and is waiting for death. It explores not only the deceits of men, but how man deals with illness and death in confined space. It was an excellent read. It is available for free download from Project Gutenburg. 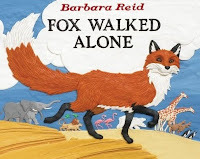 Fox walked alone is Barbara Reid's retelling of the story of Noah's Ark. It is the story of Fox who follows the other animals even though they are traveling in pairs. It is incredibly well written and the illustrations are awesome. This will be a great book for children of all ages. 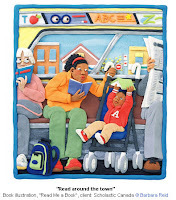 Famous for her plasticine illustrations, Canadian author and illustrator Barbara Reid is world renowned. Reid has won just about every Canadian award for children's authors or illustrators. She won the Governor General's Literary Award for Children's Illustration for The Party and this book was nominated for 7 awards. Like the first Anne book, Anne of Green Gables, I was surprised by how much I enjoyed this book. 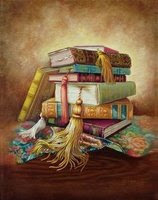 And though many think these books sentimental mush, I seemed to garner a lot from reading them. They teach me to see God in new and exciting ways - to see God more in Nature and the world around me that He has created - to look for the best in all people I meet, especially those who are hard to like, ie Mrs. Rachael Lynd and Mr. Harrison. We have to learn to see past the exterior to see the person inside. This book was written to help children see that they can change a grumpy mood. We follow Bird as he begins his day grumpy and tries to stay grumpy. 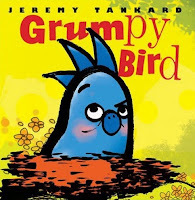 Jeremy Tankard has written and illustrated a great book, with fun, bright and vibrant colors. It is a great story book for the younger members of your families, or as a cure for your own bad mood. I read this book for a university course, and I was surprised by the book. I did not expect to enjoy it but ended up enjoying it quite a bit. I actually found that I could not put it down. There are so many themes and issues covered in the book. Like Matthew in the book, I found I fell in love with Anne and as Anne grew I was challenged to growth. Self Naming "Anne of GG"
Anne being "All Spirit, Fire and Dew." This book was so good that even though I only needed to read it for the course I ended up reading a few of the other books in the series. This was a wonderful book. I am very thankful to both Fr. Jim Link and Fr. Paul Quinon for recommending it to me. I must admit that I did not get it all, but much of the Celtic Spirituality presented touched my spirit, my mind, my intellect and my soul. It is a book about the Celtic worldview and way of life. It has made me even more homesick for the land of the Celts; it aroused a desire to return to Ireland or Scotland. Yet I realized that I would need to learn to live the Celtic way/mode here before I could even consider going back across the pond. The book made me realize how much I needed to simplify my life, and prompted me to take a semester off school to help establish a new pattern of living and of being. It prompted me to reestablish a stronger pattern of work, bible study, prayer, reading and pursuing God and his will above all else, to try to live each day to the full, to live to be a good and true friend, and to learn to be better at being. As an aside there are two more books by O'Donohue that follow the same spirit: Eternal Echoes and To Bless the Space Between Us both of which I attempted to read on a number of occasions but was unable to make it through. One of his books of poetry conamara blues - I ended up reading a number of times. I normally do not do a lot of political commentary. To be honest it is not really my thing. But The proposed Canadian Coalition Government has raised so many issues and so much debate I wanted to say a little. First a number of people on both sides of the fence on this have made some great points. Michael Davenport at Valacosa's Thoughts has one of the most reasoned and researched pieces on the events. Blazing Cat Fur has a number of posts on the topic. Also most media outlets sites have articles with 1000's and 1000's of responses. All I can say is it is legal, it has happened before federally and provincially and I for one am glad to see Harper not as prime minister. CTV's comments on growing web reaction. I actually picked this book up for the cover art. I had a friend looking to get a tattoo of a phoenix and I was keeping my eye out for images for him. This one caught my eye. But not being one to spend money on a book and not read it or at least try to read it, I gave it a go. This book is way outside my normal reading genres. First it is a spy novel, suspense thriller. Second it has a strong romantic element, yet with that being said, once into it I could not put it down. It is a fascinating story set in post WWII Japan under MacArthur's administration. It has great characters, a very complex plot and is extremely well written. It was both intriguing and heartwarming at the same time. There were numerous interesting plot twists and developments and the pace was excellent. Well I got myself tagged twice, the second was my own fault I was planning on Tagging Ebeth at A Catholic Mom Climbing the Pilliars, but had not yet responded to Jean at Catholic Fire tagged me first. Pass this on to 5 blogging friends. Open the closest book to you, not your favorite or most intellectual book, but the book closest to you at the moment, to page 56. Write the 5th sentence, as well as two to five sentences following that. "I am in a hurry and must write quickly. I have only tonight to leave for you what I can and to hide it well. I don't know if this will ever be found, but it is a good precaution, and so I'll take the time to write it. Using the basket to hide this book of secret things up high will be another challenge, but I believe I can do it without anyone catching me. We shall see." - The House of Power: Atherton Book 1 Patrick Carman. This passage was excerpted from Fulton J. Sheen's The World's First Love, Doubleday Image Book, 1952.